bitCommander is a new Windows file manager with several unique features | ComTek Computer Services Inc.
That's changing however with the beta release of bitCommander, a new file manager for Windows that features a unique interface and several other features that may make it interesting to users of the operating system. 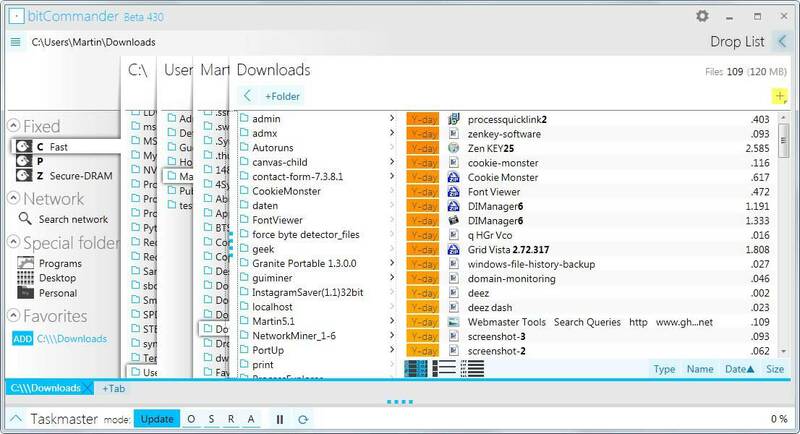 The first thing that you will notice is that it uses a different interface than any other third-party file manager that you may have come across. While it does use two panes, those panes divide the folder structure on the one side and the actual files on the other. What is great about this is that you can easily navigate between folders without having to click multiple times. It is also always clear where you are. Another thing that you will notice is that the important information are always displayed in the same location in the interface as bitCommander is automatically adjusting the space so that folder levels fit the space. This works only up to a point though as window width may decrease the size of columns so that folder names are not always completely visible anymore. You can however move the mouse cursor over any column to display all of its folders right away. The program shortens folder names that are too large so that they fit the selected column width. The program uses an algorithm to shorten folder names intelligently. Adobe Media Encoder CS6 becomes Adobe Media Enc.. CS6 for example and not Adobe Media Encod.. as it would be in Windows Explorer. The very same technique is used for file names as well provided that they are too large to fit the screen. The file manager will separate merged words automatically and highlight numbers in bold. You may also notice that relative file dates are being used by the program instead of absolute ones. So, instead of displaying the the last file modification date directly, it is displayed in minutes, hours, days, months or years instead. The data is color coded to improve visibility with today's modifications being displayed in red, yesterday's in yellow and years in gray. You can switch to the standard display however if you prefer that. The quick filter option for folders and files is another great feature of bitCommander. Just press a single key or multiple keys and the file manager will only display matching files and folders to you. The results are displayed near instant, and you can use backspace or the mouse to clear the filter. A click on the yellow plus icon in the top right corner enables you to create a to do task for that folder. To do tasks are displayed in the folder but styled in a different way. There is also a checkbox instead of a file icon so that you can mark the task done quickly. You can open multiple browser tabs easily and switch between them using tabs or the list of recently opened folders easily. The buttons the program displays are context sensitive which means that they are only displayed if selectable. The preview button is for instance not available if you select an exectuable file while it is displayed if you select an image file. Light-blue buttons perform general actions such as creating a new folder while dark-blue buttons always affect the selected files only. 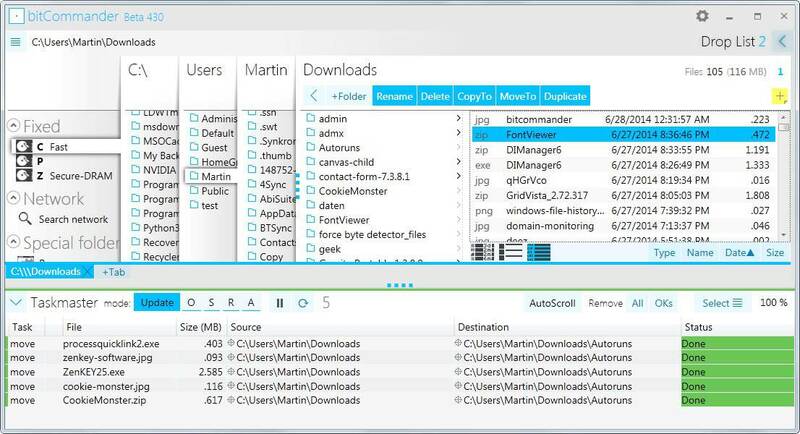 The program uses an interesting drag and drop system to move or copy files and folders around. It will only display locations where you can drag and drop files to. It is for instance possible to drag files to any folder displayed in the interface, to tabs, or the droplist which acts as a queue for future file operations. This allows you to add files from multiple folders to the queue before you move or copy them in one go. Here you can also make use of the recent destinations option which lists folders that you have moved or copied files to recently. The program will move by default and copy if you hold Ctrl while performing the operation. You can display the operation history by dragging the lower half of the interface to the top. Here you find listed all operations, e.g. copy or move operations and their status. The default mode when copying or moving files is set to update. You can change that to overwrite, skip or ask instead. BitCommander is a well thought out file manager for Windows that handles things in a different way. While experimental interfaces are often not as usable as traditional ones, you will notice quickly that it is easy to work with. You may need some time to get used to all the features it makes available, but once that is out of the way, it provides you with an interesting and intuitive way of managing files on Windows. The program ran very stable during tests. Note: The program requires the Microsoft .Net Framework 4.5, and the Visual Studio 2012/2013 Redistributable.